Are you looking for monthly Reading Comprehension Activities for your Kindergarten students? Look no further, and these monthly passages are perfect for beginning readers. This freebies set comes in three formats. 2 pages of Reading Fluency, 2 pages of Reading fluency check cut and paste, and 2 pages of Reading Comprehension will suit the needs of your students. I have provided a copy of all those pages without the “dots” for tracking. These activities work well for a small group practice, fluency practice, class discussions, homework, and for assessment use. 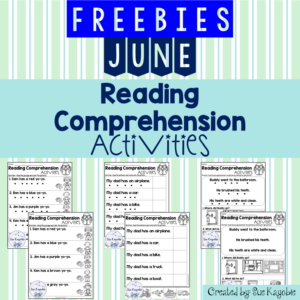 Go to my TPT store to get more free monthly Reading Comprehension Activities.